The Jamestowne Society and First California Company support Preservation Virginia’s Jamestown Rediscovery, the archaeological dig at Historic Jamestown at the James River site where the first settlers landed and established Jamestown in 1607. Preservation Virginia owns that portion of Jamestown Island where the dig is located. Until the 1980s, the presumption among most archaeologists was that any evidence of the original James Fort had long before washed into the James River. National Park Service rangers giving tours pointed visitors to a lone cypress tree many yards from its bank as its probable site. 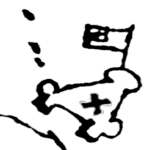 However, after some years’ study, this tiny feature of a 1608 Spanish copy of a map of James Fort enabled archaeologist William M. Kelso to locate the founding site of the colony and begin its rediscovery. 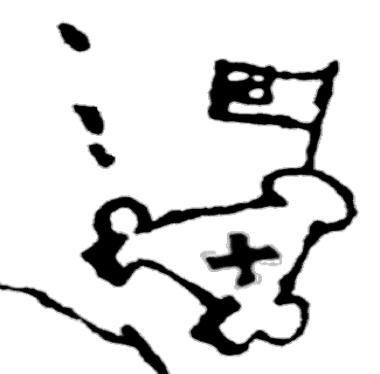 The mark is not an “X” but a cross and, to Kelso, indicated the location of the first church at the center of James Fort. A church is still adjacent to that site. 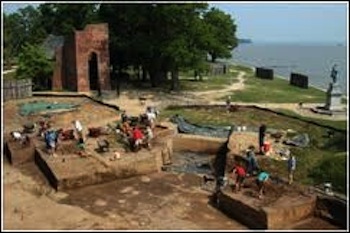 Dr. Kelso founded Jamestown Rediscovery in 1994 and almost immediately unearthed evidence of the original fort. He and his team went on to find and examine a well, probably the fort’s first. (You can read a detailed account these discoveries in Dr. Kelso’s Jamestown: The Buried Truth on our Reading List.) Since then, the archaeologists have recovered over a million and a half artifacts from Jamestown’s earliest years. A selection of them is displayed at the Nathalie P. and Alan M. Voorhees Archaearium, the exhibition facility at Historic Jamestown. Jamestown Rediscovery marked the 20th year of its archeaological research and achievements on April 4, 2014, and reports on its work regularly with digital updates. So far, the excavations and artifacts from the original James Fort offer details and new information about the structures, tools and implements that the settlers built and used in 1608 for defense, housing, commercial activities and to establish the settlement. 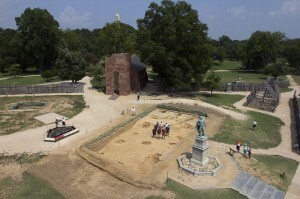 Within the Fort, in 2010, the archaeologists also discovered what is believed to be the first well ordered dug by John Smith, and the impressive (60’x 24’) remains of the first Protestant Church in America, erected in 1608, where the settlers worshiped and Pocahontas and John Rolfe were wed in 1614. Historic Jamestown hosted a ceremony to commemorate the wedding’s 400th anniversary on April 5, 2014. The Jamestown Rediscovery archeologists have been the unique recipients of three awards in five years for top ten archeological discoveries worldwide by Archeology Magazine; the first in 2010 for the discovery of the church the settlers constructed in 1608 and the second in 2013 for that of “Jane,” the cannibalized remains of a young woman who died during the Starving Times of 1609-10. It was also recognized by the BBC as one of the archeological achievements of 2013. The third award, in 2015, was for “Scientific, forensic, and genealogical work [that] identified the remains of four members of Jamestown’s leadership—and turned up at least one new mystery” from graves of Jamestown founders in the chancel of the 1608 church. The magazine also commented that “Jamestown, the first permanent English settlement in the Americas, is perhaps the United States’ most consistently prolific archaeological site.” It also received coverage in the national and local press. In May 2013, Historic Jamestown announced an important discovery that confirmed contemporary written reports of the desperation of the 1609-10 colonists. 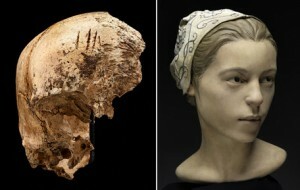 With the collaboration of the Smithsonian Institution and and Colonial Williamsburg, JR recovered and analyzed the human remains of a skull and partial leg bone that showed evidence of survival cannibalism; the body of a 14-year-old girl was used as food. Named “Jane,” she was the focus of a special exhibit at the Archaearium. JR has also produced and offers a companion DVD and booklet that details Jane’s Story, the finding, analysis and meaning of this crucial addition to our knowledge of what some of our ancestors experienced. In July 2015, the church was again the focus of a joint announcement by Jamestown Rediscovery and the Smithsonian Institution of the discovery and examination of the graves of four of the colony’s earliest founders in the excavation of its chancel. The announcement triggered international press coverage, including the genealogy of those found in the graves. Two of graves were of members of the original landing party in May 1607: Gabriel Archer and the first clergyman, Robert Hunt. The other two, Sir Fernando Wainman and Captain William West, were related to Thomas West, Lord de la Ware, who saved the colony from extinction with his fleet’s arrival during the Starving Times in 1610. The remains of the coffins and placement of the graves indicated they were among the elite leaders of the settlement at its most precarious time. On the occasion of the 400th anniversary of the founding of England’s first permanent colony in the New World in 2007, Dr. Kelso gave the visiting Queen Elizabeth II an individual tour of Historic Jamestown. In 2012, she recognized the significance of the Jamestown Rediscovery project by naming him an Honorary Commander of the Most Excellent Order of the British Empire (CBE). This is one of Britain’s highest Honors, and is given for merit and exceptional achievement. He was recognized in a ceremony at the British Embassy in Washington for his invaluable service to historical archaeology. 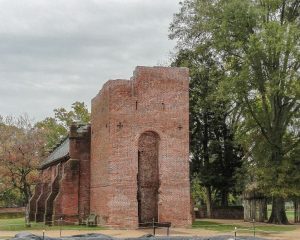 The iconic feature of Historic Jamestown is the approximately 40-foot masonry church tower, the sole remaining 17th century edifice from the colony. While its exact construction date is uncertain, it is thought to have been built in the mid-1600s. The Jamestown Memorial Church is attached to it, which was built in 1907 on the site of and around the foundations of earlier churches (see below) by the National Society, Colonial Dames of America to commemorate the 300th anniversary of the colony’s founding. In 2012, the church tower was found to be in critical need of repairs and maintenance to avoid its collapse and serious impairment of the entrance to the Memorial Church. Weather; deferred maintenance and aging took a toll that has resulted in serious structural problems. The 17th century masonry was destabilized by the use of concrete in the late 19th century in an attempt to preserve and protect the structure. It was only then learned that those more modern repair materials had been sealing the ancient bricks, preventing moisture from escaping from them and damaging the tower’s integrity. Colonial Williamsburg’s Director of Historic Architectural Resources, Matthew Webster, examined the tower and found that all of its facades, interior and exterior, required urgent attention and repointing. 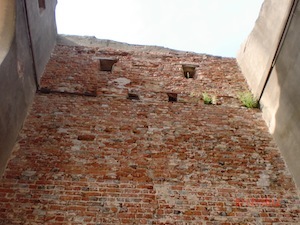 The south wall was the worst, with falling pieces creating a danger to visitors with significant repointing also needed for both the interior and exterior. Invasive plants grew out of the walls and a crack in the west wall above the arched opening needed stabilizing. The Society’s companies and members (including First California Company) felt a special connection to the church tower; the Memorial Church was the site of the Society’s founding in 1936. 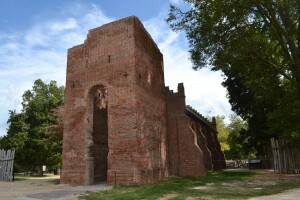 They exhibited leadership by raising the first $23,500 towards a total of $250,000 for the first two phases of the repair, renovation and preservation of the tower, which was completed in fall 2013. Colonial Willliamsburg’s restoration experts also manufactured about 5,000 replica bricks to replace damaged ones that created the instability. The restorers are also using the science of dendrochronology to study the structure’s remaining wooden element to determine a more precise date of its construction, which will assist the scholarly and archaeological work. The restoration team has completed the second phase of the project. The final phase of the project will be to install unobtrusive weather protection in the tower to assure its stability and grace for future generations. This project offered fundamental support for our Society’s mission to restore “… historical…edifices which are of lasting cultural value to the people of Virginia and of the Nation.” In every way it represents the essence of who we are and the achievements of our earliest settler ancestors, and which will enable future generations to appreciate them. We are grateful for how our members responded to this pressing need. In preparation for the commemoration of the 400th anniversary of the convening of the First Assembly, the first representative elected legislature in the New World on the church site in 1619, Jamestown Rediscovery has begun exploring the sites of both the earlier churches (1617 and the later 17th century church, of which the tower is the only remnant) within the interior of the 1907 Memorial Church. The Memorial Church sits directly upon the foundations of those built in the 1640s and 1680s. The Society pledged $50,000 to support this new project. With its first donations, Jamestown Rediscovery is now exploring the site of the 1617 church as part of an extension of the James Fort. Excavations in the church chancel began with the removal of tiles and bricks placed in 1905 during the construction of the Memorial Church. The archaeologists hope that their investigation will uncover new information about the earliest church on this site, which was built in 1617. It was here that the First Assembly was held; that extant body is now the Commonwealth of Virginia’s General Assembly. The Jamestowne Society has established the Archaeology Dig Fund to help support Jamestown Rediscovery archaeological project and cultural heritage explorations site that began in 1994. The Society requests members and companies interested in supporting this work to make donations to the Society, which will then forward the designated contribution. Donors have three options: (1) by going to the Roll of Honor page on its website, where online, digital contribution instructions are at the bottom of the page, (2) using the form for mailing donations on the same page, or (3) using the Donate Now button on the Society’s Home page and specifying Archaeological Dig Fund in the provided field. Jamestown Rediscovery is often covered by both the national and local press. The project’s progress is frequently reported in local journals. More information and its latest updates can be found at both the Jamestown Rediscovery website, its Facebook page and on You Tube.